Entrance into a hall with a full length mirror and space for coats storage. 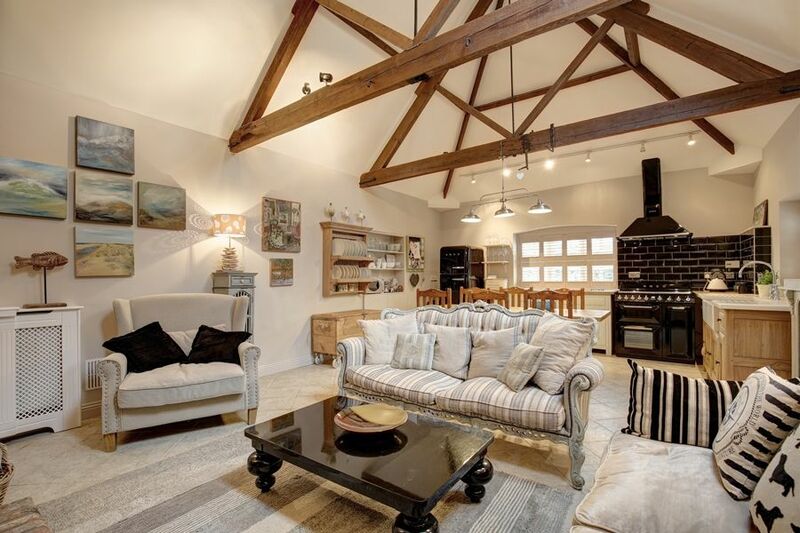 Kitchen/Living Area: Fabulous spacious living area with a high vaulted ceiling with original exposed beams and a large brick chimney with wood-burning stove. This superb area is stylishly furnished and a lovely sociable place to cook, eat and relax! There's a free-standing Fired Earth kitchen which is well-equipped with an integral dishwasher, Smeg fridge/freezer, Smeg electric range cooker with an induction hob, double Belfast sink, microwave, wooden dining table with six chairs. Guests can relax in comfort with two large comfy sofas, armchair, freeview digital TV, DVD player. Bedroom 1: Beautifully presented room with a super king-size bed, bedside tables and lamps, wall-mounted TV/DVD, dressing table and clothes hanging space. En -suite shower room: contemporary walk-in shower, vanity basin, heated towel rail and WC. There is a wardrobe in the en-suite. Bedroom 2: May accommodate up to three children and has full-size wooden bunk beds, bedside table and lamp, wrought iron day bed, wardrobe, chest of drawers and a TV/DVD. En-suite shower room: contemporary walk-in shower, vanity basin, heated towel rail and WC, laundry cupboard with a washer/dryer. A converted loft space with a sloped ceiling and velux windows, giving a lovely twin bedroom with en-suite bathroom. Bedroom 3: lovely room with twin beds, overhead bedside lights, coat-hooks, chest of drawers, wooden seat and TV/DVD. This room leads directly into the bathroom with a free-standing bath, shower mixer taps, vanity basin and WC (please note there is no door). Although there is no off-street parking, there are no parking restrictions and it is usually possible to park outside The Foundry. There is pedestrian access via the large wooden gates (which are shared with the neighbouring Old Forge). The garden has been landscaped and is completely enclosed with a picket fence. There is a raised decked area with garden furniture and inset step lighting and an astroturf lawned area. The garden has been planted with a selection of shrubs and plants.